You could wear every T-Shirt that's available from the Retropolis Transit Authority (and, indeed, you should); you could cover your walls with posters from the Retropolis Travel Bureau (which is also recommended); but even with all that art of Retropolis surrounding you, you still wouldn't get a chance to see in. And that's exactly what books do for you: they allow you to go on a day trip through a place you've never visited—which you may never visit—and while you're there you can meet the locals, get an idea of what their lives are like and, pretty often, see what terrible things go wrong for them, and what they do about that. A book is a little package full of lives and places, and all you need to do is to open it. And here's your chance to have a look at mine. They're all illustrated (sometimes in color, and sometimes in black and white) so you don't have to give up my pictures of Retropolis in order to go there. You're welcome to bring them along, whether your trip takes you to the Info-Slate switchboard, the tower of Doctor Rognvald, the offices of the Retropolis Registry of Patents, or just about anyplace else. And you can always be back by dinnertime. “... it's up to Ben Bowman and his robot assistant, Violet, to deal with breakaway floating labs, an eruption of mole people, outbreaks of blue slime, time machines and doorways to other dimensions as they attempt to save Retropolis from a spirit of innovation gone mad. 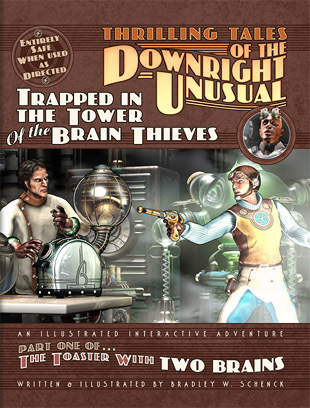 Six stories; forty-four illustrations; 250 pages; one Patent Investigator; one slightly maladjusted robot secretary; and more Mad Science than you can shake a centrifuge at, all from the author/illustrator of Slaves of the Switchboard of Doom. In the city of Retropolis - which is where the future went, when we got something else - all science is Mad. So scientific laboratories are confined to the city's Experimental Research District. It's laid out in the zoning laws, but what it really is, is self-defense. There's always the danger that something really awful might happen in the District, though: something so awful that it will escape to the city outside. That's why the Retropolis Registry of Patents keeps an eye on what the inventors of the District are doing from day to day. 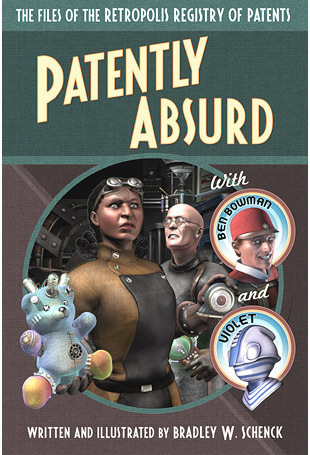 At the Registry you might meet Ben Bowman, a patent investigator who's smart in at least one or two of the ways that are important, and his friend Violet, the robot secretary. Violet is convinced that she ought to be an investigator herself. Between you and me, she's not wrong. But she's had a terrible time convincing one Patent Registrar after another that they ought to promote her; and, strangely, the Registrars never seem to last very long once they disagree. As a 6x9" trade paperback the book runs to about 250 pages, and there are forty-four illustrations. After a surprise efficiency review the switchboard operators of Retropolis find themselves replaced by a mysterious system they don't understand. So Nola Gardner pools their severance pay to hire Dash Kent, freelance adventurer and apartment manager, to find out what's happened to their jobs. That ought to be easy for Dash, even if his practical experience is limited to heroic rescues (of what he calls entities) from the priests of the Spider God, in their temple at Marius Crater. But the replacement switchboard is only one element of a plan concocted by an insane civil engineer: a plan so vast that it reaches from Retropolis to the Moon. Dash and Nola race to find the hidden switchboard and solve the mystery, and they think they're on their own. Of course they've got no idea how this plot has affected the Fraternal League of Robotic Persons, or the Ferriss Moto-Man Company, or even those infernal children from the third floor. And while everyone scrambles to save their jobs—or their freedom—the world's smallest giant robot is striding toward its destiny. An inch or two at a time. 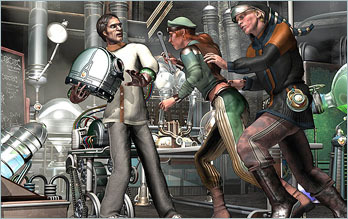 Retropolis has found ways to contain its abundance of Mad Science. But in Slaves of the Switchboard of Doom we find that when engineers go mad. . . they know how to build madness on a scale that's never been seen before. Published by Tor Books on June 13, 2017. 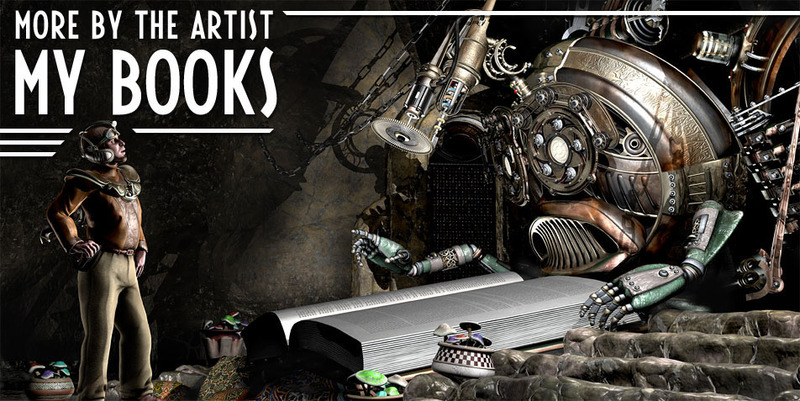 The Clockwork Book's lair lies far beneath the city of Retropolis, in the world of the Future That Never Was. As far as anybody knows, it's always been there—slowly collecting the stories, the ideas, and the secrets of its visitors, and then sharing them to those who come after. If you were to visit the Book yourself, you might realize that in its own retro-futuristic world the Book serves the purpose of a social network—a mechanical social network. With that in mind you could hardly be surprised at the misadventures its clients seem to have. And what is the Book, really, and who constructed it, and why? That's one of the few stories that the Book is not allowed to tell. On the other hand... the Book has learned how to bend the rules. 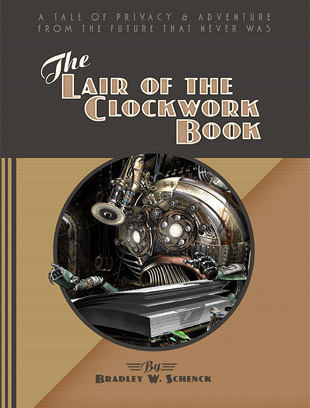 The Lair of the Clockwork Book, with more than 120 illustrations, began its life as a serial which ran from February of 2011 to April of 2012 at Thrilling Tales of the Downright Unusual. It's now available in full color (in print), or in a greyscale eBook edition. 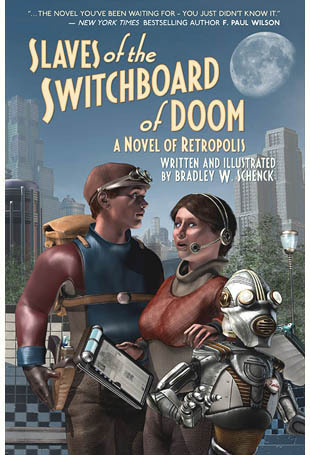 Thrill to the adventures of the Future That Never Was in this interactive, full color illustrated tale of the retro future: it’s the story of a rocket pilot, a civil servant, and the most malevolent kitchen appliance ever to stalk the lands of Retropolis—the Toaster With TWO BRAINS! The story’s set in the kind of future we expected back in the 1930’s—those days when we were really good at expecting the future—where everyone has their own rocket; where faithful robots walk the streets and skyways; where scientists, whose sanity is not completely verified, labor and tinker and invent till the cows come home. With full color illustrations on every page, you’ll be able to choose which character to follow and what they’ll do in this book. 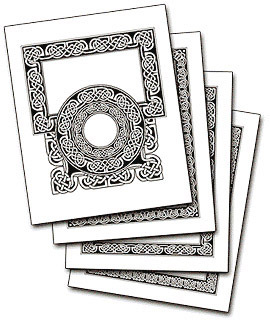 The second edition of my popular knotwork pattern book is a soft-cover version with all of the same designs and variations as the original, spiral-bound edition... and at a lower cost. The book uses a modular system in which a border design is reduced to either two or five straight sections, plus a variety of arc sections with different numbers of repeats around a full circle. Half of the designs also feature "inner border" variations. These are designed to branch inward from the main borders with T sections, and the inner borders can cross in the middle of the border with the provided crosspieces. 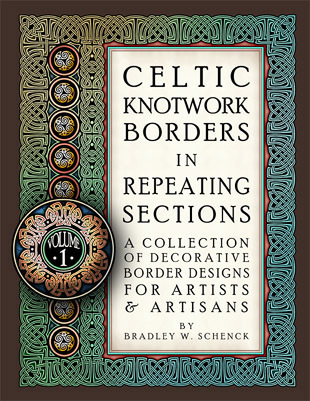 The book's approach is based on the author's experience of more than 25 years, and it's intended to teach you to think about repeating patterns in a way that'll improve your own work—the idea is that the mechanical task of laying out a border should be streamlined, leaving you free to concentrate on the much more creative work of painting, carving, or dyeing it. Wherever you choose to buy my books, please consider leaving a review! That's a pretty simple way you can do a lot of good for authors whose books you enjoy.